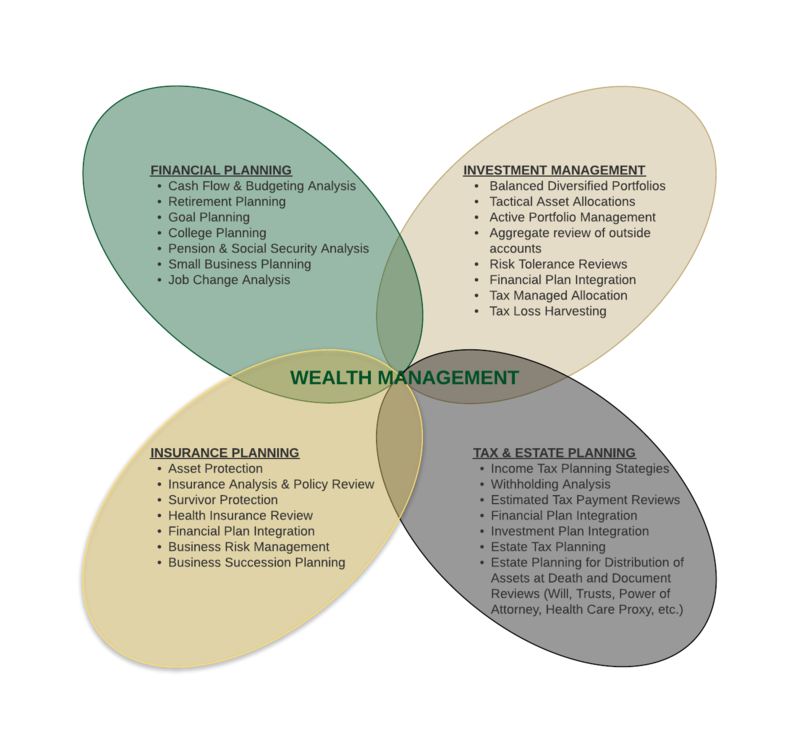 The term “Wealth Management” is often misused by firms that are more sales oriented than planning oriented. It might sound elite and exclusive, but the term was created to convey the offering of services beyond just investment management. Clients are now realizing the value of having somebody assisting with their finances that understands their employee benefits, pension plans, Social Security, tax planning, estate planning, etc. The term Wealth Management should only be used by firms that offer comprehensive services. We provide consultation and guidance on nearly every interaction you have with money. We manage investment portfolios, which are tailored for your unique financial circumstances and social consciousness. We help you understand your cash flow and we develop a living financial plan to help you pursue your financial goals. We help you manage financial risks and navigate the constantly evolving tax and legal rules that impact your finances. Our overriding mission is to be helpful and we provide consultation on many things outside of the normal list of financial services. We help clients in negotiating the purchase of a car or in filling out their financial aid forms for colleges. We help client’s in picking credit cards, managing identity theft concerns and reviewing insurance policies. If it relates to finances, we can help or we can refer you to qualified experts that we work with. Use the links on the right hand side of this page to learn more about our formal service offerings.